Love this! This self tanner has finally made it to the United States and it is amazing! My father is a melanoma survivor so my doctors highly frown upon me spending much time in the sun. It is a sad fact for me as I am a sun worshiper and I always feel so much better when I have that golden glow. A few years ago I was successfully talked into using spray tans for my main source of color, and while they have come a long way I was never completely satisfied. The color of this is so amazing that I fooled my dermatologist who is a self tanner herself. This year when I went in for my annual check up she started to give me the you need to stay out of the sun speech when I stopped her and said “oh this color comes from a bottle”. She looked at me in a bit of shock, stared me up and down and then insisted on writing down the information I gave her on where to purchase. When the nurse walked in she proceeded to tell her all about it too! I get my color in the ultra dark because yes I like to look absolutely golden! The other product from this line that is a must have is the exfoliating mitt. Mine came free with a coupon code and at first when I looked at it I thought it would do nothing for me, but after some scrubbing in the shower I saw the dead skin cells start to roll right off! 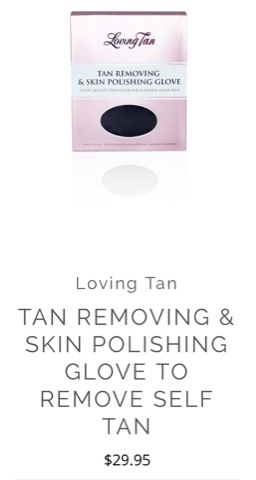 Best exfoliating mitt I have ever used, and getting rid of all that dead skin gives you a smooth consistent tan! Go check out the website and pick up a mitt while your at it!